The line between the technology and automotive industries is blurring. The rise of rideshare companies such as Uber and Lyft means that transportation is being tied ever more closely to your cell phone, while autonomous driving technology is turning your car into a computer. But these developments are expensive: Carmakers’ R&D budgets jumped 61 percent, to $137 billion from 2010 to 2014. Fiat Chrysler Chief Executive Officer Sergio Marchionne thinks it makes no sense for carmakers to spend billions of dollars developing competing, yet largely identical systems. To share some of the risk—and the cost—the incumbent automotive giants and their would-be disruptors are teaming up in an ever-growing, ever more complex series of alliances. So Fiat Chrysler, for instance, has paired up with Google to develop 100 self-driving minivans, and is in discussions with Uber about a similar venture. Google has, in turn, invested in Uber, as have Toyota, Microsoft and Tata, owner of Jaguar Land Rover. Bill Ford, chairman of the eponymous carmaker, has meanwhile invested in Lyft, as has General Motors, and Lyft has partnered with China’s Didi, itself the subject of a $1 billion investment from Apple. Uber hired Google’s VP of engineering. engineering to become VP of global vehicle programs. $1 billion in Chinese ride-hailing company, Didi, which partners with Lyft. DriveNow is a joint venture between BMW and Sixt Rent a Car. Daimler founded Car2Go and acquired MyTaxi and RideScout. VW, BMW and Daimler partnered to buy Nokia’s HERE maps. Daimler invested in Blacklane, an app for booking chauffeurs. VW hired the head of Apple’s car project, who previously worked at Daimler. VW owns a stake in the German Research Center for Artificial Intelligence (DFKI). The prize is lucrative, and the carmakers want to ensure that software players don’t win the lion’s share of it. McKinsey estimates that rideshare and onboard-data services could generate an additional $1.5 trillion of annual automotive revenue by 2030, adding to the $5.2 trillion from traditional car sales and services. And it’s attractive for consumers too: It costs an average of $8,558 per year to own a car in the U.S., but each vehicle is used just 4 percent of the time. Ridesharing in an autonomous vehicle could ensure that cars are always in use. So right wingers are calling for us to ditch the Climate Change Act entirely and to stop making progress on decarbonisation unless it is matched by other countries. Sounds good? Sounds reasonable? Well No and No in my opinion. It’s easy to say let’s not bother, let’s just go for the cheapest quickest option and to hell with the longer term consequences but sticking our heads in the sand won’t make those consequences go away. All these arguments hinge on what is likely to happen regarding Climate Change. We are all sceptical about individual scientific results after so many false scare stories about food or vaccinations etc etc but there is something different about the work of the IPCC. It doesn’t just look at one set of data from one scientist it has been looking at thousands of sets of data from huge numbers of scientists on all sides of the debate and has been returning to the data at regular intervals to incorporate new findings. This iterative process means that it rules out the occasional rogue set of results or biased experimentation. We can rely on the trends that the IPCC reports regarding the likely outcomes. What the IPCC is saying is that scientists are more and more certain that the effects of Climate Change are real, dangerous and being initiated by human actions that we are in a position to modify and that we should be doing so. Climate Change deniers are on a par with believers in a flat Earth. They just refuse to accept anything that isn’t immediately obvious from their exceptionally limited vantage point or that upsets their preconceived assumptions. They grasp desperately at any individual piece of work that casts the tiniest doubt on the consensus opinion like the measurements that show that the recorded temperature figures over the last 15 years or so haven’t risen appreciably. They ignore all the other data such as the diminishing ice levels in the polar regions, the increasing occurrence of severe or extreme weather conditions, the changing pattern of the jet stream or the changing behaviour of flora and fauna in response to the changes in the timings of season changes. They ignore any logical explanation of their pet data that might still be compatible with the consensus view such as the suggestion that the oceans are acting as more of a buffer to temperature rise than we expected which, whilst it buys us some time to make the changes we need, does not mean that Climate Change and global warming do not exist. The right wing economists suggesting that we do away with the Climate Change Act are like people who would rather burn all the furniture in their house than go out and chop some firewood in the yard. It’s certainly easier in the short term but doesn’t make much sense when you want to be able to sit down or go to bed in the future or need to pay for replacements for all the stuff you have ruined. Is it reasonable to say that we shouldn’t do anything until we can get everyone else to agree? I think not for two main reasons. Firstly it is a false claim by the Climate Change deniers that the likes of India, China and the US are doing nothing. They are making significant efforts with renewable energy and new technologies and we actually need to try harder to keep up if we are to remain a country that makes much of its wealth by technical innovation. Secondly it is true China and India are also increasing their use of non-sustainable technologies but only because their per capita wealth and consumption is so much less than ours and they would like a richer and more affluent population. We cannot reasonably say that we will not lead the way on sustainable technologies unless we first get our per capita carbon footprint down to the level of India or China’s which I would suggest we need to do by advancing sustainable tech not by making ourselves poor. The other thing that is being said is that we need to ditch the Act and reject renewable`s because “The lights might go out!” Well firstly I would argue that it is the anti-renewable campaigns that are stopping us building the scale and quantity of renewable capacity that is the problem here and a quick temporary fix through some dash for gas is not the answer. Secondly there is this unwritten assumption that the lights going out is the end of the world. If there were to be some limited phased outages during the 8pm winter peaks of demand during a couple of winters over the next few years would this really matter so much that we need to tear up our plans for long term improvements in favour of short term measures that will push us ever closer to real catastrophe? So you miss your favourate soap on broadcast TV and have to go to bed early. Hospitals and other vital services now have much better stand by generation due in part to the green incentives favouring CHP plants and old people’s homes are better insulated than they were due to the ECO schemes so a couple of hours without power won’t see the temperature drop excessively and you can always watch the program on your computer tomorrow. It is only the politicians who have made this an election losing issue who might suffer particularly if this were to happen. Lastly what are they suggesting doing that could come on line before these suggested outages in 2016-2020? About all we could do is build a few OCGT power plants of the sort that the anti-renewable lobby say are undoing any good that wind turbines do do because of the intermittency of wind. If we want to do something now we should be pushing ahead with the energy saving side of the “green crap” to keep demand down to the levels we can reach and keep building the sustainable low carbon capacity that we will need in the next decade as we reach the 2020 targets and progress beyond them toward true sustainability. "Anna has a point but unfortunately the news today is full of further calls by Owen Paterson to ditch the Climate Change Act because the National Grid is mildy concerned that there may be power cuts this winter. Ironically the final straws have been the ongoing problems with several of the nuclear power stations and the fire at Didcot gas powered station. Its hard to see what the logic is as no large scale centralized plant can be built between now and Jan 15 unless it is already under construction. There might be some fossil fuel capacity being underused but using it isn’t illegal it just means buying out a larger proportion of the ROCs so there is no need to scrap the Climate Change Act to get a short term fix like that. There might be time to build a bit more dispersed capacity which gives us a choice of fast tracking some solar and wind or building a few inefficient Open Cycle Gas units or internal combustion gas units both of which would be very polluting, expensive to run and would in all likelihood commit us to widespread fracking if we intend to use them as anything but a few months stopgap. There are people who are only interested in the easiest way to make more money. To some degree we all feel that way and that is why the cliche “Its the Economy Stupid” entered common usage. Short term the cheapest way of dealing with the problems we face are probably the dirtiest. This is why the question of climate change does matter. It is the reason why it is worth paying more for rapid decarbonisation now because it will save us much higher costs and loads of suffering in the future. The big tobacco firms spent ages casting doubt on the links between smoking and cancer and telling young smokers why give up something you enjoy now just because there might be a risk many years in the future and we cannot even be certain that there is a risk. They manipulated and bent the science until it was no sort of truth all in the name of profits. Climate Change deniers are doing the same thing now and they have the added advantage that many of the people with power and influence probably won’t live to see the worst results of climate change. " "In a way I personally feel that it almost doesn’t matter whether people believe in climate change or not, or disagree about whether it is a natural phenomena or man-made or a bit of both – what matters is that we should all have the common sense to realise either way, we simply can not go on exhausting our planet of its natural resources like we are currently doing, there will be nothing left very soon, and we have to work in balance with nature which means harnessing energy sustainably i.e., from renewable energy sources – IF we cherish the earth, its animals, our people and the future of our own children and family that is. I think that is what matters and that it is worth fighting for : ) "
According to the charity WWF (World Wildlife Fund for Nature), last year in 2012, we demanded more natural resources in eight months than what it takes the earth 12 months to produce. For the rest of the year, we lived on resources borrowed from future generations. Falling on August 22nd in 2012, this year ‘Earth Overshoot Day’ has come 2 days earlier than last year, TODAY 20th August 2013. In fact, since 2001, Overshoot Day has moved ahead by an average of 3 days per year. On a finite planet, we need to change the way we think about everything, but especially about where and how we live, work and travel, along with what and how much we consume. In short, we need to find ways to do more with less. And of course our Dorset Energized site is also jam packed with top tips to help you be more energy efficient, invest in renewable energy and generally lead a more sustainable life. Please share any other ideas you have and let us know what small steps you are taking today to reduce your personal impact on our earth’s precious resources. "Hi Chris, we know it can seem like things are a mess in the world, but please take heart – there are a LOT of good people doing good things and we truly believe that every little positive step we take as individuals can make a difference – all big global change starts with small changes by a small number of people. This very website is filled with ideas to help people make positive changes to reduce their impact on our environment while still benefiting ourselves – whether by saving money on our energy bills now, as a financial investment for the longer term, or even just to make you feel good that you are at least “doing something”! " "Today will pass by as have so many days with our mind on ourselves and our little expensive freedoms and liberties, pains and shortages. And tomorrow will come and pass the same way. And it hurts so much to see that we dont understand life, even in the 21. technological, super dooper, advanced face lift century. With all egoistic force to make this world a better place we are only creating more and more uncomfortable comfort. Tomorrow never comes… "
We know everyone is busy in the run-up to the Christmas holidays, but our local Friends of the Earth group have reminded us of a campaign by Action on Renewables to get David Cameron to stand up for green energy. It only takes a few seconds to join the call for a real commitment to clean renewable energy. They have already had a great response, and if like hundreds of others you’ve already taken part in the campaign, thank you for your support! The Government’s Energy Bill and Gas Strategy have now been published, but they’re missing something vital, a 2030 target to make sure we’re on course for cutting our carbon emissions. Green means Growth. Low carbon energy isn’t just good for the environment, it’s helping to get the UK economy get back on track. In 2010-2011 over one third of economic growth came from our low carbon economy, things like the huge London Array offshore wind farm, community solar schemes like Wadebridge, or energy from farm waste. Action on Renewables are calling on David Cameron to back a 2030 target. A 2030 target is vital to show the Government won’t pull back from the great start we’ve made in using our natural resources to create electricity in a few years time. Without it companies won’t invest, jobs won’t be created, and we’ll be locked into relying on the expensive imported fossil fuels that made up over 50% of people’s energy bills. We want to make sure that the government prioritises our home-grown green energy sources like wind power, solar, and energy from waves and tides, boosting our flagging economy, bringing long term stability to fuel prices, all while reducing our carbon emissions and keeping the UK at the forefront of the global fight against climate change. We have a chance to really change the way we power the UK. 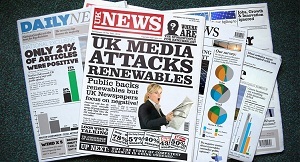 We came across this article by E2B pulse – the UK carbon reduction network on a new study which has revealed the extent of negative media coverage of renewables. The article essentially tells us what we already knew… that the printed media in particular is biased against renewables and that the nuclear and fossil fuels lobbies have been successful in promoting their industries at the expense of renewables. The public interest is best served through provision of decentralised energy generation that will prove to be cheaper in the medium to long term. Wind and solar for example cost nothing to run! It is only possible to compete with that by an attempt to totally rubbish it through misinformation. But, you can kid all the people for some of the time… (you know the rest!). Obviously the last thing centralised energy companies want is energy independence and much lower bills to their current consumers. The best thing that renewable energy enthusiasts such as myself can do, is inform people as honestly as we can, how we can install our own domestic renewables and buy our electricity and heat from a specialist energy supplier with a renewable energy focus. Then enjoy our lower energy bills while others continue to be fooled into an upward spiral of dependency and cost. The Energy Bill: Is the future green? After weeks of delays and political bickering, you could be forgiven to thinking that ‘the greenest government ever’ were taking the time to produce an Energy Bill that delivered clear energy policies whilst concentrating on lowering carbon emissions. But what was the outcome? After months of attempts from the coalition to agree on this topic, a decision was made to delay any target until at least 2016. This opens the door to a ‘dash for gas’ favoured by George Osborne, and it was quietly announced that a Gas Generation Strategy will be released next month. According to the independent Committee on Climate Change (CCC), following this strategy will put our legally binding carbon budgets at risk increasing the chance of large scale fines. Another problem arises from this short term solution to a long term problem. If a decarbonisation target was introduced in 2016, then newly built gas plants would need to be shut down early to ensure the target is reached. This would invoke a spike in gas prices and leave a hole in the energy mix – a substantial future problem that seems to have been side-lined. This announcement also seemingly ignores the 50 companies, including Microsoft and Marks & Spencer, who signed a letter to George Osborne stating that they needed to see a decarbonisation target as a sign of commitment and stability from the government before investing in the UK. In what was widely believed to be the product of a compromise on the decarbonisation target, significant funding has been cemented for investment in renewables, nuclear and carbon capture and storage – with the aim of a 30% contribution to the energy mix by 2020. At least £7.6 bn a year will be available come 2020, to aid development through so-called contract for difference (CfD) incentives, a government initiative aimed at producing low carbon electricity projects. This will provide some consolation and certainty to investors that were hoping to see a decarbonisation target. It will lead to further increases in energy bills, but these will largely be offset by efficiency gains. A strong, short-term investment now means we will reap the financial benefits in the long run. This mechanism will provide additional payments to thermal plants that agree to supply back-up power as the UK becomes more reliant on intermittent energy sources. This is due to start in the winter of 2018-2019. In conclusion, it feels like we are walking what is a 100m sprint. No decarbonisation targets mean there is a free rein on emissions over the next 4 years at least. With the gas strategy, the government have shied away from making tough decisions now which will benefit the country in the long run. Eventually every country will be reliant on renewables, so why not switch now and become a leading player? Yes, the clear intent from the government to invest in renewables is a major step forward but it might be some time before we see the benefits. For something more inspiring and to take action TODAY, check out Dorset Energized’s web pages on choosing renewable energy, switching to a renewable energy supplier and some of our tips on Energy Efficiency. The Dorset Energized team have been waiting for the release of the Energy bill which is designed to encourage low carbon investment such as new windfarms. We have been given that the Tories have been grappling with the lib dems and derailing all their plans for utopia from day 1 (remember proportional representation?). I guess it was only a matter of time before they put a spike in the wheel of their arch-enemies’ chariot – the world famous Climate Change Act introduced by Labour. A few years ago I went to Whitehall with Tony Hamilton from Poole Agenda 21, where we were proposing that Climate Change is a planetary emergency that needs to be dealt with outside of party politics – a bit like the government during the last war. How visible does that emergency need to be before party idealogy can be put aside? Anyone notice the juxtaposition of news about the Energy Bill and the news about widespread flooding? By deferring setting carbon targets, especially when those targets need to be front-end-loaded, just makes the overall aim of reducing our carbon emissions to 20% of what they were in 1990 so much more difficult to reach, especially when even the emissions the government have been reporting for the UK (which are not the whole picture) have shown a 20% increase since 1990. All the more reason for people to start taking action by themselves! We can all help to get the UK and the planet out of this mess. Use less energy, use it more efficiently, and where you can generate renewable energy, and pester your MP to start taking your opinions on energy and climate change into account. As a start, check out our pages on switching to a renewable energy supplier and some of our tips on Energy Efficiency. "I agree with Theresa’s comments its time for us to act if our Governments will not. Pester your local MP ask him what he thinks and ask him to come out publicly. Do everything to get this message out there and use this site to advise, help, offer hope for the future. " "There is a great link on the Greenpeace site I found which gives the lowdown on the Energy Bill in simple terms for people like me who find the whole thing baffling. http://www.greenpeace.org.uk/newsdesk/energy/analysis/energy-market-reform-six-things-you-need-know I switched to Good Energy this week through this site – so I can use my money personally to encourage low carbon investment. Can’t sit around waiting for the government to take action can we? " I have stumbled across this fantastic website and wanted to share it with you! 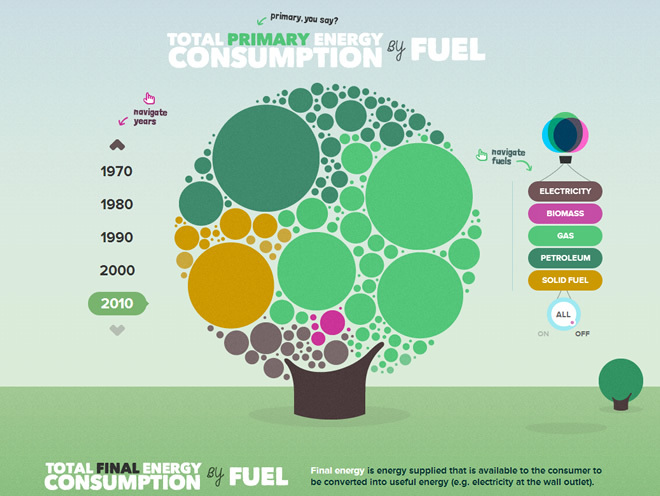 A green electricity company called EvoEnergy have produced an interactive site (designed by Epiphany Search) to show how energy in the UK has changed over the last 40 years. In 1980 when I was just a baby, Solid Fuel accounted for 36% and Petrol 37% for primary energy consumed, with Gas 22% and Electricity making up just 5%. After 30 years as of 2010 Gas use alone has nearly doubled and has risen up to a staggering 43%. Good news is that Petrol has reduced slightly to 32% and we now use Biomass as a renewable energy but that currently accounts for only a pathetic 3%. It is very interesting to see the changes over the years (decade by decade) but we have a LOT more work to do – by 2020 I hope we’ll see a major increase in electricity specifically generated by renewable energy sources (including Wood Energy (Biomass), Solar Energy and Wind Power) with very little reliance (if any!) on petrol and gas. I guess the only way that will happen though is for us, the people – yes that includes me, you and your family – to make changes today and start investing in renewable energy for our future. At least to stop using petrol we now have supercool electric cars like the Nissan LEAF (not quite the personal ‘hoverpacks’ my Dad wants to be able to fly around with, but we’re getting nearer!). And of course if you do just 1 thing, you can simply switch to a green energy supplier such as Good Energy and be more energy efficient by using less energy in your home – to save energy, save money and feel more secure. "The Evoenergy interactive guide is great. It would be lovely to have something similar that could represent personal energy use so that people could model making changes to see what the impact would be. I just wanted to add another suggestion for saving energy, which is to buy less stuff. Have a look at http://www.storyofstuff.org to see the story of stuff movie. It only takes 20 mins but it’s 20 mins of a roller coaster ride through the recent rise of consumerism – you will never look at a shop window in the same way again …:) "
Dorset Energized are very excited to hear that plans are now underway for Climate Week 2013, and there are loads of ideas on the Climate Week website to inspire! Climate Week is a supercharged national campaign to inspire a new wave of action on climate change. It culminates with thousands of events and activities taking place throughout the week of 4 to 10 March 2013, planned by organisations from every part of society. Showcasing real, practical ways to combat climate change, the campaign aims to renew our ambition to create a more sustainable, low-carbon future. Climate Week is backed by every part of society – from the Prime Minister to Paul McCartney, the NHS to the Met Office, the TUC to the CBI, Girlguiding UK to the National Association of Head Teachers. During the first Climate Week in 2012 over 3,000 events were attended by half a million people across the UK. You can now register for your organisation to take part in the Climate Week Challenge, Britain’s biggest ever environmental competition, where over 130,000 people participate and entries are judged by celebrities and it is completely free to take part. The prestigious Climate Week Awards recognise the most inspirational and impressive actions taking place in every sector of society. The judging panel has contained figures such Tony Juniper, Special Advisor to the Prince of Wales Charities International Sustainability Unit, the former President of Ireland, Mary Robinson, and the Bishop of London in the past. The Climate Week Swap is a new element to the campaign for 2013, highlighting the positive impact that swapping clothes, books, toys, DVDs and other items can have on our environment. Run a swap event in your school, community group or workplace to save resources from going to landfill. All those who register a Swap event will be entered into a draw to win a swap with a celebrity. There are a number of other elements to the campaign. Bubble and Squeak for Climate Week is encouraging people to make the food that they eat a part of the solution to climate change. They can do this by joining in the call to action of eating a low carbon meal during Climate Week, either by using up leftovers to make Bubble and Squeak or by cooking food made from local ingredients or less meat and dairy. The Climate Week Pub Quiz will be run in hundreds of pubs and workplaces. Start thinking about how you can showcase your organisation’s sustainability initiatives and engage your members in Climate Week 2013. There are loads of ways you can take part! Check out our ‘Things to do Guide’ for how you can get involved or create you own event promoting positive solutions to climate change for Climate Week 2013! Whatever you are doing, make sure you register your event on the Climate Week website and help to create a national movement for change. Keep a look out for news on how Dorset Energized plan to celebrate Climate Week, and for more information on Climate Week or to register your event go to www.climateweek.com. Skills for Self Reliance are offering various eco courses including on; Renewable Energy, Sustainable Building & Construction, Food & Nutrition and Lifestyle. Venues in Dorset include Monkton Wyld (near Charmouth, Bridport) and Kingston Maurward College (Dorchester). Skills for Self Reliance is a unique public, private and third sector partnership, which links together 5 partners who provide training in a wide range of skills such as permaculture, sustainable construction, anaerobic digestion, running an eco-business, developing herbal products and much more. Thanks to funding secured by the project they are able to offer many places on their training courses at a hugely subsidised rate and in some cases free of charge. For more information and to book a course email sophie@s4sr.org.uk or visit their website at: www.s4sr.org.uk. When thinking about our carbon footprint, our attention naturally goes to transport, holidays, heating – all things that clearly use oil. However, for most households, their weekly food shop makes up a greater proportion of their carbon footprint than transport. Unlike driving your car, though, it is not immediately obvious where you are clocking up the carbon, or how you can reduce it. It’s not all about food miles. More important is how the food travels those miles. Bananas and oranges, for example, travel huge distances, but do so by boat because they store well and are naturally well-packaged, and so their carbon footprint is modest. On the other hand, those out-of-season luxuries grown in Africa or South America and air-freighted to the UK, like asparagus, blueberries and mange tout, have a colossal footprint. To put some figures on it, a kilo of bananas has a carbon-equivalent footprint of 480 g; that of a kilo of air-freighted asparagus is 14 kg, that’s nearly 30 times as much! Another major factor is how food is grown. Again, bananas are grown in the tropics with no input of heat and light – it definitely wouldn’t be ‘green’ to grow them locally! Major offenders in this respect are the salad and mediterranean vegetables grown in artificially heated and lit Dutch greenhouses and trucked to the UK. It actually uses less carbon to grow them naturally in Africa and air-freight them, but neither option makes any sense. Tomatoes grown in artificial conditions in winter can have a carbon footprint of up to 50 kg per kilo, compared with 0.4 kg when grown in unheated greenhouses locally in summer. The third main factor in your food carbon footprint is whether it is animal or plant based. When you feed soya or grain to animals instead of directly to humans, they use most of the calories to walk around, keep warm and generally do their thing, and little to actually make meat or milk. Beef has a carbon footprint of around 16 kg per kilo, compared with less than 1 kg for wheat. Chicken and pork have a far smaller footprint than red meat, because they are ready to eat at a much younger age and they don’t produce methane in digesting their food. All of these figures are obviously approximate, but they make it easy to see the difference between different kinds of food. Cutting down on winter tomatoes or having a meat-free day once a week will have a major impact on your food carbon footprint, as will sticking to the UK season for asparagus, but its not worth depriving yourself by cutting out bananas and oranges. The Department of Energy & Climate Change (DECC) have published some guides on the various aspects of the Green Deal which are available to download. 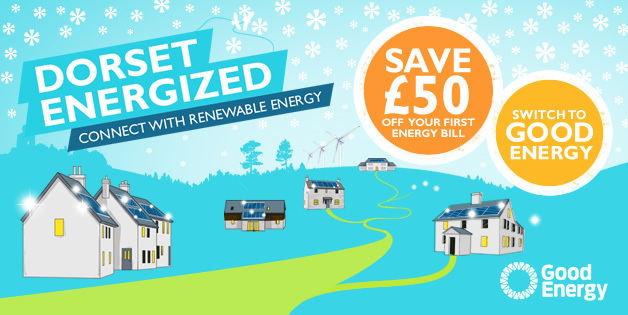 These are aimed at domestic customers, and will hopefully make it easier to access funding for a wide range of energy efficiency measures AND renewable energy measures. Funding will be available from the end of January 2013.